Not exactly a director that plays by the genre rules, the prolific Takashi Miike now takes his talent in genre-bending to the pure romance world with For Love's Sake (Ai to Makoto), based on Kajiwara Ikki's 1973 manga series. An epic story of a rich high school girl who falls in love with a tough young gangster, Miike's take on the story breaks all the rules with musical numbers (with music by popular music producer Kobayashi Takeshi), tongue-in-cheek humour, and in-your-face violence. 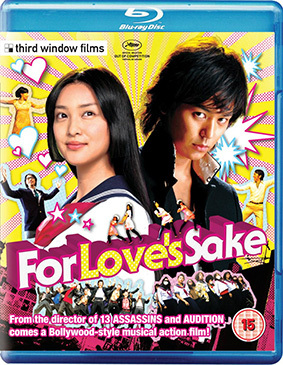 Starring Satoshi Tsumabuki (Villain) and Emi Takei (Rurouni Kenshin) as the star-crossed lovers, For Love's Sake is a unique and wild ride set to change your definition of what a pure romance can be. Takashi Miike draws on his prolific directing experience to create a vivid, generation-spanning love story filled with emotional pain, humour, violence and tenderness. Soliciting unforgettable performances from his talented cast – who include Satoshi Tsumabuki (Villain, Tokyo Family, Tokyo!) Emi Takei (Rurouni Kenshin) Sakura Ando (Love Exposure, Our Homeland, Penance) – Miike imbues For Love's Sake with an indomitable spirit. Apparently. We are, after all, taking the PR spin at its word here. Born in 1960 in Osaka, Miike graduated from film school in Yokohama. He apprenticed under directors Shohei Imamura and Hideo Onchi before making his directorial debut in 1991. Miike quickly became one of Japan's busiest film makers, directing over 80 works across all genres. His unmatched energy, skill and in some cases boundary-pushing explicitness in adapting the various source material behind his films became his signature. In recent years his work has gained a high international profile, with 13 Assassins screening as world premiere in Venice in 2010 and Hara-Kiri: Death of a Samurai the first 3D film to compete for the Palme d'Or in Cannes. Among his other films are Rainy Dog (1997), Audition (1999), Ichi the Killer (2001), Happiness of the Katakuris (2001 – a previous genre-blending work weith musical numbers), One Missed Call (2003), Crows Zero I and II (2007, 2009), Sukiyaki Western Django (2007), Yatterman (2009). For Love's Sake will be released on UK Blu-ray and 2-disc DVD in June from Third Window Films at the RRP of £19.99 for the Blu-ray and £14.99 for the DVD.